I have never felt it so difficult to write a post for you all that I am feeling right now but I will still write it and share because I already have been holding back so many things for so so long. I have to let so many things out of my system and there is no better way than sharing these with my blog family. 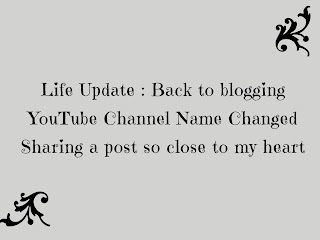 It has been a really really long time since I am almost absent on my blog. I have not been able to share anything for nearly an year now and today, when I have finally gathered my thoughts and put myself together, I still find it so hard. It is hard because I actually don't know from where do I start. If you have read my last post about Neutrogena Naturals Night Cream on my blog then you must be having an idea of how my life and skin was not getting the attention it needed and I was finding ways to keep my skin healthy without investing too much time. I was pregnant with my second child when I shared that post and after that life kept getting busier with each passing day. It started to get even more challenging to take care of my own health and skin as I stepped into my third and final trimester and my elder daughter grew to be more demanding. So, I got my parents here in Australia for a short trip so that they could help us during my delivery and postpartum. I was hoping to see a relaxed life after my parents' arrival at our home here but life was not that kind to me. My brothers met with a tragic road accident when they were on their way back to our home in India after seeing off my parents at IGI Airport Delhi. My parents had boarded the flight when the road accident happen so they could only come to know after reaching Australia. When they reached here, we were so happy but our happiness lasted for a short while only as right after having their breakfast when my parents called my brothers , they got to know that they were admitted in PGI, Chandigarh. It was the biggest shock of our lives that we got and to make it even more devastating, we were miles away from them. I was not allowed to travel as my delivery date was not too far then and parents also could not leave me in that condition. It was the toughest time for our family when we were so helpless that we could not do much despite of waiting. Thanks to almighty that my brothers could survive that deadly accident because no one believed that any passengers would have survived upon seeing their damaged car. I am in tears while typing all this but at the same time determined to complete this post. My second baby was born and I was counting days so that I could recover after my C-section and travel to India to see my brothers. So, when my daughter was 1 month old, I went to India and to be honest I wanted to stay there only. I was so depressed after going through that tough time when we all needed one-another so badly but we all were helpless...but I had to come back as it was not easy to live away from my husband who had no choice because he had to work here in order to manage our expenses. Slowly and gradually our lives started getting normal and back to the track and I started posting videos again on my YouTube channel, "Henna Nail Art and Beauty". However, it was not easy to share what I do in daily life to take care of my health and skin and the way I do my makeup because you need to plan and work for days in order to create a good quality video of 2 minute duration.. So I remain absent on my blog because I was not able to take out enough time for all of the things that I was wanting to do...so I waited to come back to Australia so that my kids could start their school and I could get back to work. During all these months,I was continuously working on discovering the products which were effective for me and made my life simpler. Being a mommy of 2 toddlers now , I can not have 20 bottles of skincare products in my bathroom because I know that those will end up on our carpet, walls and floors before going on my face so I try to buy minimum products which multitask too.. so lesser number of bottles, more space on the shelves, more budget for baby diapers and simpler and happier life. I have also discovered some hacks for beauty conscious mums which are helpful in many ways and save your precious time. I have changed my detailed and long morning and nighttime skincare to be quick and effective. In short, I have become more active and smart now..hehe.. There is a lot that I have to share with mums especially because I know the struggle to make yourself and your house look good at all times is real and it is not at all easy. Hence you will now see a change in my blogposts and my videos too because I will share all those hacks which I myself have been trying and loving to make my life simpler and that too without neglecting my own health and skin. 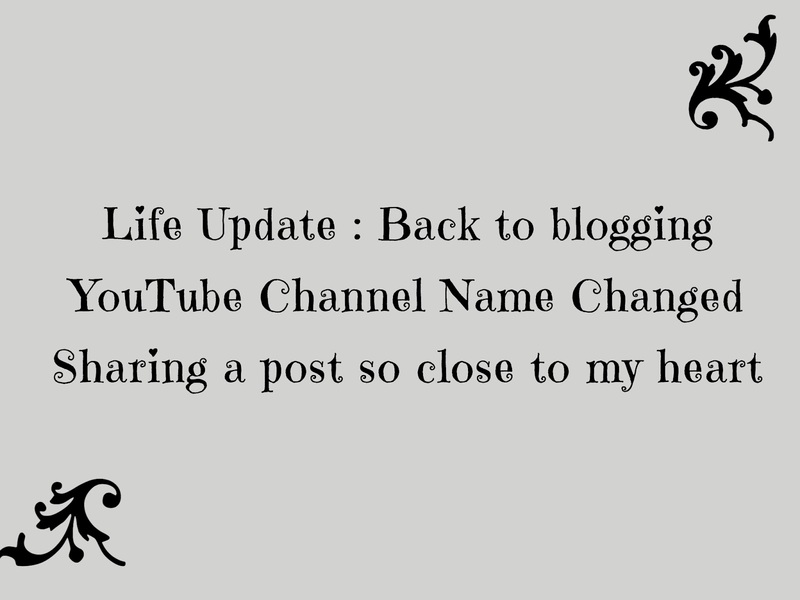 I have changed my youtube channel name too and now it is "Urban Mom Ritu".. I love it .. the old one was very weird so I never liked that to be honest. Do you like it ? Let me know in the comments below. This reflects the kind of videos I will be sharing now so I believe this is the best that I could finalise. I am going to be posting lots and lots of interesting and useful posts for you all on my blog so stay connected with me here and on my social media so that you don't miss anything. I can go on and on in this post but I will stop here now as I have to click beautiful pictures of an amazing product for all of my lovely readers.